East Walworth by-election - Labour, Lib Dem and even the Conservative activists have been energetically fighting for votes in the East Walworth ward in the run-up to polling day on Nov 29th. 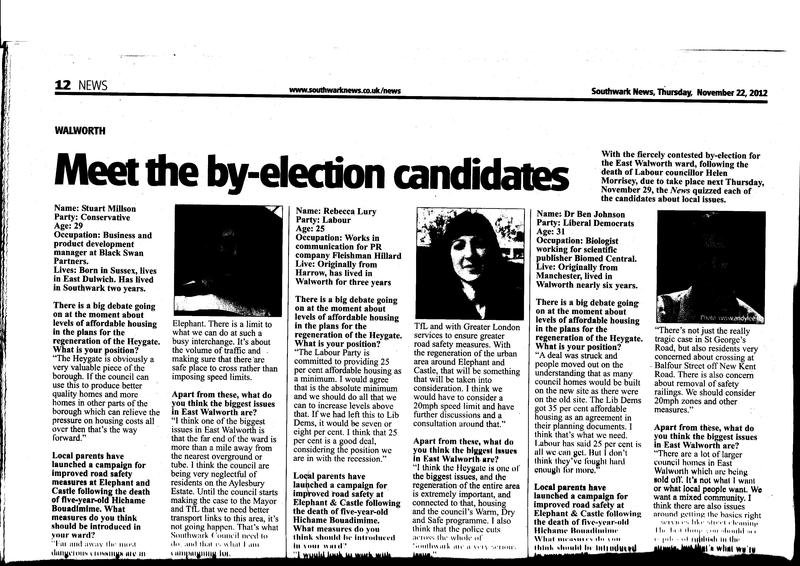 The candidates’ profiles were featured in this week’s Southwark News. It is disappointing to see all three candidates toeing their respective party lines on Heygate affordable housing, rather than stating out an independent position: the Conservative says - get the money and spend it elsewhere; the Labour candidate says - it’s as good as we can get, fingers crossed it will get better; and the Lib-Dem says - we can get more (but doesn’t say how). East Walworth needs to be represented by councillors who are prepared to put the interests of their constituents above party loyalty. The only way we are going to get any more affordable housing out of Lend Lease is by making it plain that their current applications will be rejected at planning committee unless both the level of affordable housing is increased and that rented affordable is at council rent levels. That is the commitment local people are looking for from each of the candidates. Social rented housing is affordable but not all affordable housing is social rented - We are strictly non-partisan so we cannot say which candidate does not yet know the difference between ‘social rented’ and ‘affordable’ housing. But they have been telling voters on the doorstep that the Heygate redevelopment will have 25% social rented housing. If only this were the case. As anyone who reads our blog will know, there is a big difference between the two: all social rented is affordable, not all affordable housing is social rented. ‘Affordable rent’ is the most misleading kind of affordable housing and that is what all the 1-bed and 2-bed flats will be on the new Heygate. According to recent research by Southwark News £800 per month is what local estate agents estimate will be the affordable rent on Phase one. Local Election Hustings - All the candidates have been invited to a hustings on Tuesday 27th November 7pm at the Crossway Church, New Kent rd. This is a public open meeting where electors get the chance to put their questions directly to the candidates. Topics will include not just the Heygate redevelopment but also East St. market, transport, open space, car parking, cycle routes, sustainability and green spaces. More information will be provided on this in the near future. Siege of the Elephant - Alternatives to the profit-led scheme that Southwark are currently wrestling with, were discussed at a gathering of over 70 local people, housing activists and academics at Pembroke House on Saturday. Amongst many interesting presentations one was from a global architecture, design and consulting firm, who got an honourable mention for the Building Trust’s ‘HOME’ competition. It shows how the Heygate could have been refurbished at £14,000 per unit and saved the 40,000 tonnes of embodied carbon that is going to be lost through the demolition of the estate. While the proposal came in for some criticism, we think it is worth serious consideration and its time may yet come. Council Leader Scrutinised - Eight pertinent questions were put to council leader Peter John and Councillor Veronica Ward about the financial viability of the Heygate redevelopment at last week’s overview & scrutiny committee meeting. Amongst them were how much money is Southwark getting out of the regeneration agreement, and how much money is Lend Lease getting? The committee would also like to know what St. Modwens plans to do with the shopping centre, and how the funding gap for the transport infrastructure is going to be bridged. Last but not least, what kind of affordable housing was Southwark actually getting out of the deal, and why should it be any less than either the 35% that policy requires or the 25% that the regeneration agreement promises. Councillor John made an interesting comment in his answers, that money paid in-lieu of building on-site affordable housing by other developers[S106 money] might be used to buy homes from Lend Lease to be let as council houses. Councillor John further commented that “I’m told it’s not a very cost-effective way of doing things” and we can see why. On-site affordable housing is sold at a fixed unit price, much lower than market price. It would hardly make sense to effectively pay Lend Lease not to build affordable housing, using money other developers have given to Southwark because they haven’t built any affordable housing either. Simon Hughes calls for transparency - This week’s Southwark News also reported that Simon Hughes has called for the financial viability assessments for the Heygate development to be made public. It is becoming clear that these financial documents are critical to the future of the Elephant & Castle redevelopment. The Heygate planning applications were due to go to committee in October, but have now been delayed until January. Such delays are not unusual but they usually mean that the developer and the planning department are in disagreement about a major aspect of the application. Southwark Council are fully aware of the viability risks and has prudently listed them in its ‘risk register’. Lend Lease successfully argued that they could only afford the equivalent of 12 affordable housing units at the St. Mary’s Residential tower block development, instead of the 90 units policy requires (paras 41, 42 officers report, below). This demonstrates their skill in using viability assessments to justify dropping the social benefits of redevelopment schemes. Making the financial viabilty assessment public would reassure the local community that this isn’t going to happen on the Heygate. St. Mary’s Residential Parties split - The narrow approval of the planning application for St. Mary’s Residential development revealed differences of opinion amongst the lib dems and labour parties: three labour councillors and two lib dems voted for the application, while two lib dems and one labour councillor voted against. Unlike other committees, the planning committee is not ‘whipped’. This means councillors vote on the merits of the proposal as they see them and cannot be directed in their vote by the party machines. It doesn’t always happen that way though. So credit to the councillors who voted against.